Surrounded by the Sonora Desert, just four miles from downtown Tucson, this hotel is across the street from Reid Park, which is home to the Tucson Zoo and golf courses. Set on 14 acres of lushly landscaped grounds, this hotel features a heated outdoor pool and whirlpool in a citrus tree-lined courtyard, a 24-hour fitness center, three tennis courts, therapy rooms and more. Comfortable and inviting guest rooms feature contemporary styling with mountain or garden views and thoughtful amenities. 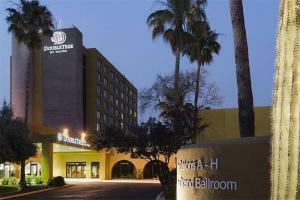 Located about 7 miles from Tucson International Airport.